If you follow me on Instagram, you might have seen that we got a new toy this weekend in the Sweet Bella Roos’ household. My husband has been wanting one for quite some time now, and finally talked me into spending a small fortune shelling out the cash making the investment in our newest member of the family. Meet our new Blendtec. I think my hospital bill for my first born cost less than this baby. Now don’t get me wrong, I’ve heard that it truly is an investment and worth every penny, but it’s going to take some convincing before I welcome it in with open arms like I did it’s equally pricey sister, my beloved Kitchenaid. James couldn’t wait to fire that baby up. Only after reading the instruction manual, of course. Yes, my husband may be one of the few men that read the instructions. Cover to cover. Every time. He then made me solemnly swear to never put it in the dishwasher or use a metal utensil. At his previous job they had a Blendtec, and he always talked about how he blended everything; he even blended soup which makes no sense to me. After a quick trip to the store for some kale and spinach, he was ready to make his first green smoothie. I don’t know what all he put in there, but his smoothie ended up a lovely shade of brown instead of the bright green like the ones that fill my Instagram feed from all you healthy people. I will admit that it did an awesome job of pulverizing the heck out of the fruit and vegetables… however it still didn’t taste amazing. I’ll work on that. In the meantime though, it was my turn to play with the new toy, so naturally I made something with pumpkin (and sugar). Which made me think maybe I could blend up some of my Pumpkin Cheesecake Rolls and just drink them as a sinfully delicious “smoothie”… but I digress. I had a bunch of apples left over from making caramel apple favors for Sophia’s birthday, so I decided to make pumpkin apple butter. Core, peel, and dice your apples. Steam them for 8-10 minutes or until soft. Add all of the ingredients to a blender and pulse until desired consistency. If your butter is too thin, add a small (1/2 - 1 tsp) amount of corn starch to thicken. 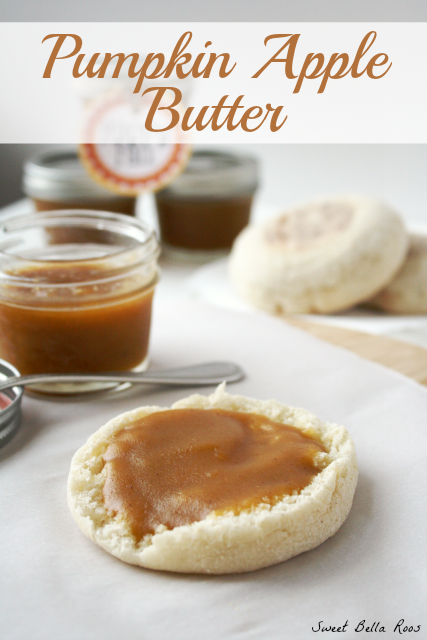 This is delicious spread on homemade bread, rolls, or biscuits. You could also stir some into your oatmeal. I knew we wouldn’t be able to finish off an entire batch within 2 weeks so I decided to give some away as gifts. 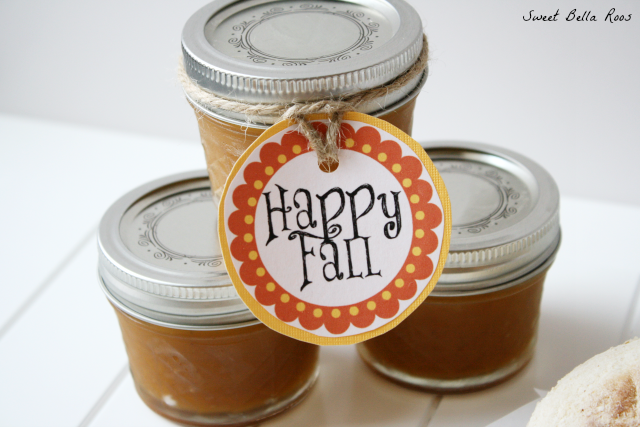 Come back Tuesday for the free ‘Happy Fall’ tags printable. Sounds so yummy, especially for the fall season! Thanks for linking up with Merry Monday! This looks great. Thanks for the canning tips very helpful. Hi – I would love to make this as part of our teacher gifts this year – how long can it be left out of the fridg after making? Can’t wait to try this! What kind of apples did you use? Hi Sara- I used green granny smith apples. 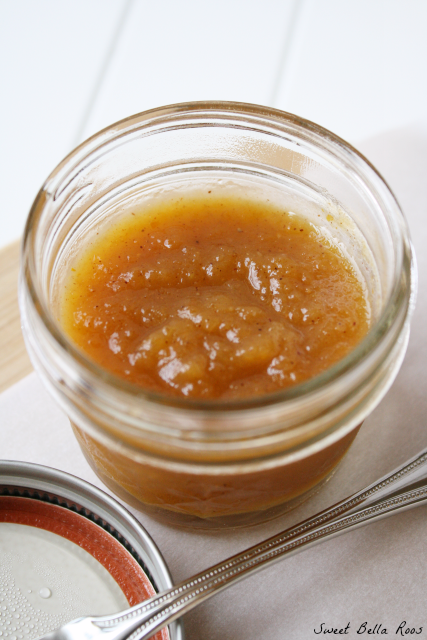 How do you can this wonderful pumpkin apple butter? I’d warm the pumpkin apple butter in a pan on the stove top, then just fill the clean jars almost to the top (leave about 1/2-1 in. ), put on lids and rings and boil in a water bath for 15-20 minutes. Thanks for that tip, Anna! Yes you can can this. NO you cannot safely Can this. Pumpkin is on the NO can list unless it is in chunks in liquid. This is only safe if kept refridgerated. You can buy canned pumpkin purée and even canned pumpkin butter, so I don’t know why it would be unsafe to can. Thanks so much for sharing. I can’t wait to make this. When I do I’ll link it back to you. Pinned it also. It was delicious! We didn’t have English muffins, so I just put it on buttered toast, and Jett said it was the “best thing ever.” When Jack’s piece fell on the floor the first time, Jett volunteered to eat it. When Jack’s piece fell again, Jett looked at me beseechingly and said, “I’d still eat it.” 🙂 And the tag was so cute, too. Thanks for the fall treat.